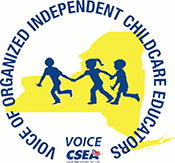 Family-based child care providers are supported and represented by two unions in New York State: CSEA VOICE (Voice of Organized Independent Child Care Educators) and UFT (UFT Home Child Care Providers). Under the umbrella of CSEA, VOICE represents registered family and licensed group family providers in 57 counties across New York State (outside NYC). UFT represents providers in the five boroughs of New York City. Please use the contact information below if you would like to learn how these organizations can support the valuable work you do nurturing and teaching young children and their families.